On Sunday 20th May, Steve Williams and Dan Jackson both took part in The 7th Annual Piecycle Ride, an annual charity bike ride raising funds for The Air Ambulance Service. 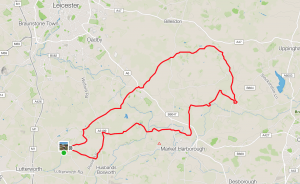 The 41 mile route through the Leicestershire countryside started in the village of Kimcote and headed north east towards Medbourne before looping back to the Dog and Gun in nearby Walton. The riders all enjoyed a well earned pie and a pint at the pub. The ride raised over £5,000 for The Air Ambulance Service and continues to be a well supported event. The ride was also the first outing for the new Adroit Real Estate Advisors cycling jerseys, pictured above. UPDATE: Piecycle 2019 has been confirmed for Sunday 12th May 2019, places can be booked using this link.